What is a good way for very small political party get some attention? If all else fails, voluntary de registration looks like it will do it.The Alliance On De registration; Why We Did it and Where To Now? What is a good way for very small political party get some attention? If all else fails, voluntary de registration looks like it will do it. Since the Alliance Party requested to be de registered on May 22nd social media has been buzzing, and the press are queuing up for comment. How did they even find out? The party was only officially notified by the electoral commission that they had accepted our request on May 27th and it is not to be gazetted until June 7. The Alliance is bemused and a little embarrassed. Basically we have had a bit of an administrative lapse. We were late sending out our three yearly renewal forms and realized that we would not get them back soon enough to be confident that we would have the 500 eligible financial members with properly updated membership forms by April 30th – the date the Electoral commission requires membership declarations to be submitted for each year. We had hoped to get an extension until the end of June to get our membership list in order. However the Electoral Commission was not able to allow this. So the decision was made to request voluntary deregistration in the interim. Ironically this happened because key members were preoccupied with more pressing concerns – the TransPacific Partnership agreement being the main one. But, having taken the plunge and deregistered, we are finding the process rather liberating and now feel the need to take some time to look at the pros and cons of rushing to reregister. There are considerable financial costs in being registered political party and the administration is time consuming for an party with no paid staff. There are more pressing issues. Political parties in general are not well regarded. The most frequently heard comment from the public seems to be “one’s as bad as the other”. And that is more perceptive than it might at first seem. 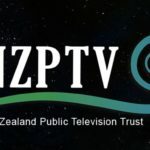 New Zealand, and the world, is fast approaching the stage where it won’t matter what political party is in power, the large multinational corporations will be driving policies. The amount of money required to mount credible electoral campaigns in virtually every country in the world, means most political parties rely on large corporate donors. 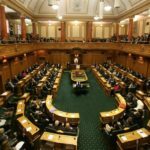 The push for corporate friendly trade deals with Investor State Dispute Settlement clauses gives corporates carte blanche to do whatever they want no matter what country they are in or what political party is in power. What the corporates want to do is make money for themselves, as much of it as possible. No matter who or what gets damaged in the process. the assault on democracy by large multinational corporations in the short term. And challenging accepted concepts like the need for ever increasing corporate profits and even ever increasing economic growth in the long term. A completely different way “doing business” is vital to tackling climate change, poverty and inequality. Like minded political parties and community groups are realizing that we have to work together, both as community based activists and in deciding how to contest general elections. We need to maximize the chances at the ballot box to be able to make a real difference if elected to parliament. The traditional “my way or the highway” attitude of the Left, on matters large and small, is changing. The Alliance has evolved to the point where we are keen to work on these issues; to explore ways of organizing our own party to energize members to get involved in much more than the traditional fundraising and electioneering members of political parties are usually relegated to. And to work constructively with others outside the party wanting to tackle the stuff that really matters. That said the Alliance hopes to maintain a core membership that meets electoral commission requirements so that we can at any stage apply to reregister as a political party and stand a list in the general election if the need arises. 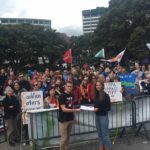 The Alliance will not see New Zealand voters without the option of a Left party on their ballot paper.